The flattering ao dai (pronounced ‘ow yai’) of Vietnam is one of the most beautiful national costumes in the world. There isn’t a better souvenir to take home than a well-tailored ao dai to impress your friends and family. The ao dai embodies beauty, grace and elegance. Naturally, every Vietnamese woman has at least one in their wardrobe. It is a long-sleeved, body-hugging tunic with ankle-length panels at the front and back, worn over trousers. It is said to cover everything, but hide nothing. Each ao dai reflects the body of the person wearing it, so it only suitable for only one person alone. This is why most ladies get theirs tailor-made for their shape, size and style. You can buy ready-made ao dais, but this does not guarantee the perfect fit and will lack the elegance of a properly fitted, perfectly tailored ao dai. Plus, it will be another mass-produced item without care for quality, rather than one that is personal, unique and with a story. The best thing to do is go material-shopping and then hand it over to a tailor shop that will take your measurements and create for you a masterpiece. There are many stores that sell fabrics around Ho Chi Minh City. You can easily come across them as you walk around the main areas of the city. If you would rather not play it by ear, just drop by any of the main markets in the city such as Ben Thanh, Tan Dinh, Binh Tay, An Dong and Tan Binh market. These have sections dedicated to fabrics and clothes, and you can easily find materials to suit your taste. There is also Soai Kinh Lam market which only sells fabrics, so if you do not find what you are looking for in the others mentioned above, you will surely find what you want at Soai Kinh Lam fabric market. Once you have selected your favourite fabric, then you can head over to a tailor shop to get your ao dai made. Bear in mind, these tailor shops also have selections of fabric for you to look through and choose, but come at a higher price than what you would pay at a fabric store. Miss Ao Dai offers you endless possibilities on material and style for your ao dai. All you have to do is choose a material that catches your eye, get your measurements taken by the lovely staff, and wait. The artisans here successfully convey Vietnamese aesthetics through each unique and exquisite piece they create, so you are guaranteed something beautiful. And it only takes just four hours! Miss Ao Dai is also a very famous souvenir shop and the three-story establishment is full of little Vietnamese trinkets, lacquerware, artwork, accessories, bags, purses, jewelry and furniture. You could kill a couple of hours just browsing around. A great and much cheaper alternative to Miss Ao Dai, is Ao Dai Ngoc Chau tailor shop. Here you can get your custom-made ao dai tailored for as little as VND$300,000 (USD$13). Of course, this depends on the quality of the fabric you choose from the shelves and how intricate you wish your piece to be. The elaborate designs created by the professional and dedicated staff here are well-received by customers who have nothing but positive things to say. 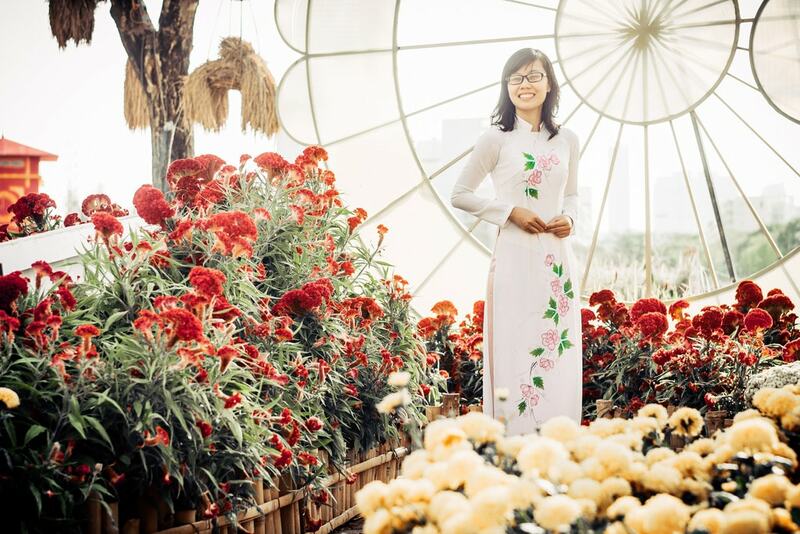 Ao Dai Lien Huong is extremely popular with the trendy local crowd and is emerging as an ideal place to get the beautiful ao dai tailored in style. The embroidered patterns created here are extremely intricate and impressive, but also costly. Prices range from USD$300-$1000 here depending on style, detail and material involved. Expensive as that is, you will happily pay it when you realise Lien Huong is a world-renowned fashion designer, and that her work has been featured in many international venues in Asia, Australia, America and Europe. Some of their work are showcased on their website. Minh Khoa is another famous fashion designer of Vietnam. Most of his designs are Western-influenced and he often adds an imaginative, flirty and fun twist to them. His unique work has been spotted at fancy parties across Asia. Due to his fame, he has two stores open in Ho Chi Minh City that each display one of his current designs. This means you can buy off-the-rack, or you can work with him to create something even more perfect, to fit your style, shape and personality. Expect to pay over USD$300 for an ao dai here, and it could take a week for your piece to be finished. Le Minh Khoa is married to top model Hoang Men, and they have two children, a boy named Cotton and a girl named Silk. That’s dedication.